India and Singapore enjoys long traditions of friendship based on mutual trust and respect and a shared history, reaffirming that further with a much broader “Strategic Partnership” as the two countries work with one another. Against the backdrop of the 50th anniversary of diplomatic relations between India and Singapore, the two Prime Ministers, Narendra Modi and Lee Hsien Loong. signed the Joint Declaration establishing the “Strategic Partnership” between the two countries. The two Prime Ministers decided to sustain the momentum of bilateral relations through regular high-level visits. They encouraged the continuation of regular exchanges under the agreed dialogue mechanisms between the Foreign Ministries and the Defence Ministries. They welcomed the signing of the revised Defence Cooperation Agreement which will upgrade and strengthen bilateral defence relations. They agreed to hold regular high-level meetings, including at the level of the Defence Ministers. They endorsed the continuation of joint military exercises and training between their Armies, Air Forces and Navies. They welcomed further collaboration in defence technology, and encouraged co-development and co-production between the defence industries of the two countries. They welcomed the signing of the Technical Agreement on the Sharing of White-Shipping Information between the Indian Navy and the Republic of Singapore Navy in July 2015 and they witnessed the signing of the documents for its operationalisation. They endorsed regular exchanges between the two Coast Guards and looked forward to greater bilateral Coast Guard Cooperation. They noted the useful discussions between both sides at the India-Singapore National Security Roundtable meetings and affirmed its continuation on an annual basis. They welcomed the revival of the Joint Working Group on Intelligence Cooperation on Combating Terrorism and Transnational Organised Crime in order to intensify cooperation on information and intelligence sharing on terror networks and work together to share experiences on dealing with the growing phenomenon of radicalisation. They noted the ongoing interactions in cyber issues and agreed to strengthen bilateral cooperation in this area. The two Prime Ministers also agreed to establish appropriate mechanisms for regular bilateral consultations and exchange of real time information between the relevant agencies in India and Singapore. They witnessed the signing of the Memorandum of Understanding on Cooperation in the area of Cyber Security. They witnessed the signing of a Memorandum of Understanding on Cooperation in Combating Illicit Trafficking in Narcotic Drugs, Psychotropic Substances and their Precursors. The two Prime Ministers recognised that bilateral business and commercial linkages constitute key drivers of the wide-ranging India-Singapore partnership. In this regard, Prime Minister Lee noted the policy measures and economic initiatives introduced by Prime Minister Modi and noted that specific initiatives launched by Prime Minister Modi such as ‘Make in India’, ‘Digital India’, ‘Skill India’, ‘Clean India’, ‘Affordable Housing for all by 2022’, ‘Namami Gange’ and ‘Smart Cities’ offered significant collaborative commercial opportunities for businesses and industries of both countries. 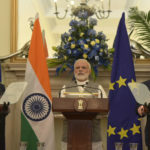 The two Prime Ministers recalled the five focal areas of cooperation – the 5-S, identified in August 2014 by their respective Foreign Ministers and, in this regard, instructed their respective agencies to continue to work towards enhanced cooperation in these areas through specific programmes and projects. The two Prime Ministers reaffirmed the significance of the Comprehensive Economic Cooperation Agreement (CECA) signed in 2005, which remains the bedrock of economic partnership between the two countries. They desired an early conclusion of the Second Review of CECA. They welcomed the setting up of a Joint Working Group (JWG) between the Indian Ministry of Commerce and Industry and the Singapore Ministry of Trade and Industry to address bilateral trade and investment issues. Noting that two-way trade has more than doubled since 2005 to US$17 billion, they aspired to further double trade. They encouraged investors and investment institutions of Singapore to increase their investments in India, with the aim of doubling investments. They noted the efforts towards modernisation of the railways sector in India, and agreed to explore the feasibility of participation of Singapore companies and investors in the redevelopment of railway platforms in India They encouraged greater interaction between trade and investment bodies and organisations of the two countries to focus on priority areas. They emphasised the importance of collaboration between the SMEs of the two countries. Building on the extensive bilateral economic and trade linkages between the two countries, they agreed to explore possibilities to enhance financial cooperation to facilitate financing and investment to support economic growth and infrastructure building in India, and enhance financial resilience. To this end, they decided to establish a financial dialogue process between India and Singapore, as mutually agreed. The two Prime Ministers affirmed their commitment to enhance bilateral connectivity links in the aviation and maritime sectors. They agreed to expand existing and new commercially-viable air links between and beyond both countries. They agreed to enhance cooperation in capacity-building and share best practices by becoming “knowledge partners” in aviation and maritime sectors. They welcomed the signing of the Memorandum of Understanding on Cooperation in Civil Aviation Sector which will open opportunities for collaboration in development of airports in India. Both sides welcomed the India-Singapore Maritime Conference to be held in India in early 2016 with the participation of key players in the maritime sector, and looked forward to greater cooperation in this sector. The two Prime Ministers agreed to enhance cooperation in the area of urban solutions and sustainable smart city development. They welcomed Singapore’s contribution of the Master Plan for the new Capital City of Andhra Pradesh, Amaravati, and encouraged investors and investment institutions in Singapore to take advantage of the immense investment opportunities provided by the new Capital. Prime Minister Modi encouraged Singapore to explore the possibility of developing urban centres under the Smart Cities initiative. They welcomed the signing of the Memorandum of Understanding in the field of Urban Planning and Governance under which urban administrators from India will undergo specialised training in Singapore. The two Prime Ministers visited Singapore’s Institute of Technical Education and Prime Minister Modi noted with satisfaction Singapore’s contribution in upgrading selected Industrial Training Institute (ITI) centres in India, including in New Delhi and Rajasthan, which help serve as models for other skills centres in India. Prime Minister Modi welcomed Singapore’s interest to consider establishing a Skill Centre in the North East through train-the-trainer and consultancy projects. They welcomed the ongoing exchanges under the framework of the Memorandum of Understanding on cooperation in the field of Personnel Management and Public Administration and agreed to continue to work closely to deepen public service cooperation, including in capacity-building in areas such as e-governance, and sharing of best practices. They welcomed the ongoing programmes for training and sharing best practices, including the training of civil servants from India and workshop on Mission Ganga Rejuvenation or Namami Gange Project. Recognizing the critical role of various States of India in expanding cooperation and exchanges between India and Singapore, the two Prime Ministers decided to accord high priority to promoting exchanges among them in the area of sustainable urban development, especially in infrastructure development, water and waste management. They agreed to facilitate exchange visits by trade delegations, high-level participation at economic summits, exchange of best practices and capacity-building. They welcomed the on-going training programmes in the area of ease of doing business to be conducted by institutions in Singapore for officials from India. They noted the successful organisation of the Year of India in Singapore in 2014-2015 and the Festival of Singapore in India on the occasion of the 50th anniversary of diplomatic relations. They witnessed the launch of commemorative stamps by both countries to mark the historic milestone. They noted with satisfaction the active exchange of cultural exhibitions, in particular The Peranakan World: Cross-Cultural Art from Singapore and the Malacca Straits exhibition held at the National Museum in New Delhi in February 2015 and the Treasures from Asia’s Oldest Museum: Buddhist Art from the Indian Museum, Kolkata exhibition at the Asian Civilisations Museum, Singapore in June 2015. They welcomed the signing of the 6th Executive Programme on Cooperation in the fields of the Arts, Heritage, Archives and Library for the years 2015-18 through which exchanges of artists, art groups, exhibitions, arts and heritage professionals, and sharing of archival knowledge will continue between the two nations. Prime Minister Lee welcomed the extension of the loan agreement for artefacts between the Archaeological Survey of India (ASI) and the Asian Civilisations Museum (ACM) as a special gesture of India. Prime Minister Modi appreciated Singapore’s gesture of returning the statue of Uma Parameshwari. They agreed to continue the promotion of interaction and cooperation between their higher education institutions, as well as encourage the exchange of students and academics. They appreciated the ongoing collaboration between the Indian Council for Cultural Relations (ICCR) and the National University of Singapore which is host to the ICCR Chair on Indian Studies. The two Prime Ministers noted with appreciation the significant contribution of the Indian community to the socio-cultural and economic development of Singapore, and the rich historical links between the two nations. They welcomed the opening of the Indian Heritage Centre in Singapore which highlights these aspects. Prime Minister Lee welcomed India’s decision to include Singapore in the Electronic Tourist Visa Scheme. They also agreed on the importance of regular dialogue on consular matters between the respective concerned authorities. Both Prime Ministers welcomed greater air links between both countries which would further cement people-to-people exchanges. The two Prime Ministers agreed to work towards enhancing effective legal and judicial cooperation in criminal, civil and commercial matters. The two Prime Ministers highlighted the importance of bilateral parliamentary exchanges and agreed to reinvigorate reciprocal interaction and exchanges between parliamentary delegations. They instructed their respective agencies to explore cooperation in areas of mutual interest such as joint workshops to serve as platforms for researchers to interact from both countries. They noted the ongoing cooperation in science & technology and the joint R&D projects being implemented in focused areas of advanced energy materials and biomedical technologies, and welcomed further ways to explore bilateral engagements. Prime Minister Lee noted the launch of Singapore’s first indigenous satellite, X-SAT by India in April 2011, and further launches by Singapore in India, and welcomed India’s continued support in this regard. The two Prime Ministers agreed to continue to work closely together with other ASEAN Member States to strengthen ASEAN Centrality, enhance connectivity, and support the ASEAN Community-building process covering the three pillars of the ASEAN Community. They agreed to support regional efforts to create stronger humanitarian and disaster relief capabilities, combat disease threats and boost regional trade, including through the Regional Comprehensive Economic Partnership (RCEP). They expressed support for a modern, comprehensive and high quality RCEP as a concrete pathway for India to deepen its engagement with the region and play an important role in the regional architecture. They underscored the importance of closer consultation and coordination between India and Singapore in regional fora, including the ASEAN-India, East Asia Summit (EAS) and ASEAN Regional Forum processes. They welcomed the strengthened ties and partnership between their Armed Forces in disaster relief, including through India’s accreditation of an International Liaison Officer to the Changi Regional HADR Coordination Centre in Singapore in July 2015. Both leaders underscored the imperative of delivering concrete outcomes on this important subject on the occasion of the 70th Anniversary of the United Nations through the inter-governmental negotiation process. They also called for reinvigorating multilateral action on terrorism, including through the finalisation and adoption of the Comprehensive Convention on International Terrorism in the United Nations at the earliest. The two Prime Ministers also discussed their collaboration in other international fora. They decided to support an open, rules-based multilateral trading system under the World Trade Organisation (WTO). They reaffirmed that both countries seek to advance the safety, security and sustainable development of international civil aviation and shipping at the International Civil Aviation Organisation (ICAO) and the International Maritime Organisation (IMO).They reaffirmed their shared commitment to maritime security and freedom of navigation, and safety of sea lines of communication in accordance with international law, including the United Nations Convention on the Law of the Sea (UNCLOS). They reaffirmed their commitment to building up the Indian Ocean Rim Association (IORA).